Why do we care that algorithms make decisions, or that social media platforms hold all of our data and market to us? Yesterday, I went with the current crop of MSc Data and Society students to the Science Museum’s Our Lives in Data exhibit. Sponsored by Microsoft and PwC among others, the exhibit includes demonstrations of face recognition systems and aggregate data profiles created from thousands of taps in and taps out on the London Underground. In viewing these examples, I was inspired to revise a recent talk that I delivered at the Vrije Universiteit in Brussels. Here is a new version of the talk: Citizenship and (Location) Data, that refers to examples in the Science Museum. 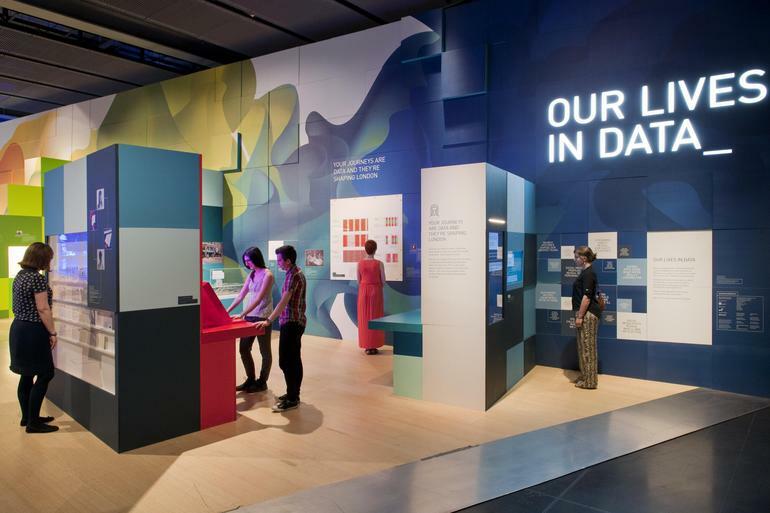 Gallery view of Our Lives in Data – an exhibition exploring how big data is transforming the world around us; uncovering some of the diverse ways our data is being collected, analysed and used. As long as we’ve had new technological innovations, we’ve had people connecting technical features to forms of life. Early 20th century sociologist Georg Simmel even worried about how clocks and watches would create an urban society where people rushed for the sake of it. The expansion of electricity, and then radio and telephone, all implicitly established ‘connected’ and ‘disconnected’ citizens – and also created regulations that stipulated rights to access such technologies. Our ongoing concern about ‘digital divides’ in access to internet connectivity is a response to the assumption that one’s full participation in civic life depends on access to information technology – so we think about claiming ‘communication rights’. Of course, thinking about expanded access as a precondition for participation also creates a new space for access providers; governments and companies that promise to bridge the digital divide but who also benefit from selling more people the means of access. Now, technologies of datafication transform everyday acts into streams of data and make them available through platforms. A new dynamic of relationships is established – and it has a significant impact on how we might think about the ‘active’ citizenship where people speak and are heard on things that matter. Broadly speaking, it’s possible to see a shift in ways of talking about and building supports for citizenship that moves from thinking about citizenship as access to a network towards thinking about it in terms of producing data for action. This shift has big implications for people and for institutions, because it changes the kinds of intermediaries at work. Rather than organizations providing access, the new civic intermediaries collect, process and present data. And just like the time when big companies like Cisco and IBM created strategies to participate in expanding access to networks, we now have big companies (sometimes the same ones) as well as governments and third sector organizations developing ways to benefit from or intervene in data collection. This shifts the conceptual plane on which its possible to make rights claim about citizenship. The data ecosystem that needs to be established to make data actionable is based on IT access that is so ubiquitous as to include connected everyday objects. There is no longer a claim for a right to be included, to become a member of a network, but an expectation that everyone is on the network and, furthermore, that they are constantly producing data that can be captured to represent their actions on this network. There is a compulsion to participate, as to stay outside the network would remove all of the benefits of being connected. Staying on the network produces data. The internet’s architecture makes it possible to trace clicks and links between content, and the expansion of connectivity to GPS-enabled mobile devices and other sensor-equipped technologies means that more things produce data. But data by itself is meaningless. It has to be cleaned, rendered, calculated and presented. Location data is a good example of this. By itself, it is a . Other scholars have argued that the paradigm of datafication means that citizenship gets collapsed onto data production – that ‘citizens become sensors’ (Gabyrs, 2015). This is certainly part of the process, but ideas about good citizenship are also created in the overall framework of processing data in order to take action. Instead of claiming rights of access, citizenship is shifted towards contribution to an aggregate for the purposes of decision-making. In the museum, Transport for London presents posters aggregating the underground or bus trips of thousands of people. In the aggregate, patterns start to emerge and the exhibit suggests that these patterns create ways for agencies like Transport for London to make decisions about how to provide underground service that is more optimal for citizens. It’s also worth thinking about how ‘optimization’ has itself become a framework for citizenship – a model of consumer choice extended to the provision of services and the everyday experiences of people. Optimization depends on effective prediction – theorists of governance who follow Foucault have identified how technologies of rationalization have positioned certain kinds of civic acts as desirable and others as undesirable – and many predictions are now made based on aggregated data. When a main framework for civic life is in relation to optimization, some things are going to be easier to fit in the framework than others. It’s relatively straightforward to optimize transportation or the collection of recycling, but more difficult to optimize volunteering, knowing your neighbours, or creating local capacity. This also raises some interesting issues of ethics – like the ethics of aggregation. When prediction decisions are based on aggregate data, a lot depends on what that data includes. While press coverage focuses on the role of algorithms in face recognition, insurance calculations and other realms, what’s really at stake is the data. At the Science Museum, my students wondered if an algorithm judging age and happiness based on facial features might develop judgement rules based on a larger sample of Caucasian-featured faces compared to Asian or African-featured faces. Prediction in the service of optimization might also, over time, structure kinds of ‘ideal’ ‘good citizenship’ based on people behaving in ways that create data or play into processes of ‘optimization’. There are myriad examples of this: from the data produced for transport providers to the exchange of data about friends and connections for continued access to media platforms that make money by optimizing the connection between audiences and advertisers. We are beginning to understand the implications of the monopolies on intermediation that these companies create. The expansion of the mediated network suggests that everyone can participate, and hence, in order to behave well in this new environment, that they SHOULD participate. Optimization as a frame also influences civic projects that are attempting to create bottom-up alternatives. For example, FixMyStreet, a (now-classic) interface for crowdsourced contributions of local problems, collects location data points and user-generated content identifying maintenance problems that cities should fix. Gabrys (2014) identifies how this creates a kind of ‘computational paradigm’ for citizenship. I argue, building on this, that the FixMyStreet platform itself plays an important role in creating optimized citizenship: it not only suggests formats for easily computable data (as Gabrys points out) but does the computation and returns the results in ways that allow governments to optimize their expenditure on maintenance by identifying areas of maintenance that, if addressed, will be positively viewed by the people who submitted data. This optimizes the relationship between the government and these people, but the relationship cannot account for the views of the people who have not used the platform. On one level, these people might be excluded from access to communication networks, but on another level, their failure to submit data to a platform system that could calculate it into something that would make government’s work optimal removes them from consideration. Optimizing governments work in this example requires civic data production – of calculable units – but it requires an intermediary to work on it too. Sometimes civic data projects build their own intermediaries. This is certainly a step in the right direction, but it’s not exactly a disruption of the process of defining citizenship in the direction of optimization. This has some consequences, as the drive towards optimization can, over time, shift influence away from participatory Cyclestreets, a non-profit organization that develops cycling maps based on contributions from individual cyclists, developed a trip planning and problem reporting application in Hackney, a London borough with a very high level of. The app collects data from the GPS function of cyclists’ mobile phones and provides this, along with information on the purpose of the trip and basic demographics, to Hackney Council so that the council can understand use of cycling infrastructure as well as its problems. Individual cyclists who use their bikes primarily for utility journeys such as getting to work may also want to use the app to record times, distances and calories burned, share journeys and upload reports of problems they have encountered in their daily journeys, including photographs and descriptions – much like FixMyStreet. Cyclestreets then uses volunteered data to create cyclist-produced maps, but all of the data is available to Hackney council to analyse and use in policy decision-making. This application is developed from open-source technical tools and creates a relatively direct means for citizens to share data with government, via problem reporting and sharing of chosen cycle journeys. The app is free to download, and Cyclestreets does not benefit financially from its use. However, it also relies on the logic of datafication, both in terms of the cyclist’s ideal knowledge of their own cycling behaviour and in terms of the borough’s decision-making: the data from the app legitimates some decisions about cycling infrastructure development and perhaps limits others. It also reiterates a logic of optimization. Because of this, the Cyclestreets app and many others like it are becoming superceded by corporate apps that request access to many types of customer data from smartphones rather than relying on volunteered data. These applications, including Citymapper, are extremely easy to use and provide very well-calculated cycling routes that do not require much input from So the civically-minded data citizen imagined by Cyclestreets who volunteer data are displaced by the consistently data-producing Citymapper customers, who benefit from more optimal experiences of navigation. Optimization is one of several possible actions taken in relation to data. These examples have illustrated how working towards optimization changes the mediation of citizenship, and thus, in some ways, the qualities or expectations created in relation to citizenship. Optimization as an action valorizes data creation and increases the significance of intermediaries who can make civic actions optimal – which creates different forms of exclusion than those related to lack of access. My point in all of this is that the creation of technological frameworks for citizenship creates some key dilemmas. The dilemmas result from the frames or protocols that define ‘good’ technological citizenship as working in a particular way. I also think there are some productive an interesting ways to respond to these dilemmas. There are both normative and critical perspectives to take. I’ve talked specifically about optimization as a feature of the focus on data and calculability. There are other features: participation, transparency and predictability. All of these features build from and are wound into the framework of data for action. They can’t easily be resolved, revealing how hopes for technology reveal ongoing power differentials, across the past twenty years of techno-civic projects in cities. These projects generate dilemmas relating to the ways that citizenship should be understood or enacted in relation to newly available technological tools. The dilemmas show that power and agency are always at work in influencing who can speak, be heard, or act in relation to things that matter in the places they live. This entry was posted in Uncategorized on November 5, 2016 by Alison.